After a sequel to a hit children's movie and a Harrison Ford film failed to ignite the box office last weekend (and in fact resulted in one of the worst summer weekends since 1997), it's now up to the third installment of the Austin Powers series, Austin Powers in Goldmember, to lift the summer from its doldrums. The summer of 2001 saw a late rally, with four straight weeks of $40 million openers. This year will be very hard-pressed to repeat that feat, but the presence of Austin Powers here could start a similar three-week run. Definitely not contending as a film that could push the $40 million mark is the borderline-hallucinogenic The Country Bears, the other new wide-release film this weekend. If there's one thing that the past month has shown, it's that there may not be any such thing as a bulletproof premise anymore. Take your audience for granted and they'll burn you back. Men in Black II was a stale retread and made over $10 million less opening weekend than the first, after factoring in inflation. Stuart Little 2 seemed to have an audience all to itself but failed to expand its core kid demographic. All-time box-office champ Harrison Ford failed to excite in his recent outing. The heir to his throne, Tom Hanks, has a movie that is doing well with an against-type character, but not as well as could be hoped. So an Austin Powers sequel isn't as much of a slam-dunk as it might have been even six weeks ago. This is especially apparent when you look at the content of the ads; up until recently, they inspired not even a single titter. A recent re-cut of the commercial may have just saved them, as what had come before was downright embarrassing. Fred Savage with a mole? Is that the best you can come up with, Mike? It's rare when you can see a beloved franchise melt down before your very eyes. The campaign for the film has been extremely aggressive, stopping just short of lining up people on the street and forcing them into theaters. It's at the point where the ancillary marketing is funnier than the marketing for the actual movie (Britney Spears getting punched in the face is always funny). After two films making fun of the '60s, Goldmember moves up ten years to make fun of that sacred cow, the '70s disco scene. This would have seemed fresher had he not been beaten to the punch by Undercover Brother earlier this summer. 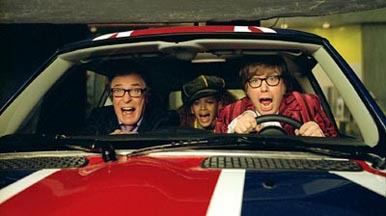 Still, the Austin Powers series has enough good will to guarantee at least one more hit, right? Not so fast. Batman & Robin may be an extreme example to take, but it's the prime example of a franchise doing almost everything possible to alienate its fan-base. An almost $10 million drop in opening weekend from the previous entry in the series was just the first step in its spectacular implosion. The effect won't be that extreme here, but I feel a backlash building that could seriously hurt this film. I don't see it rising to the stunning heights of the second film in the series. There's enough general good will to the series to lift it to about $46 million, but unless the film is dramatically better than the ads, it's going to have a serious battle to get to the $150 million mark. Sometimes, a film is so strange, so bewildering in concept that it defies explanation. I applaud the fact that something quite as bizarre as The Country Bears was pitched, written and even made it to completion, but that doesn't mean I'm about to spend money to see it. This is also mitigated by the fact that it's a crass attempt by Disney to build movies around its theme park attractions (The Haunted Mansion and Pirates of the Caribbean are next). I'll resist the 'em-bear-assing' pun but really, this film teeters on the edges of utter ridiculousness. Haley Joel Osment supplies the major "star" power, but does so only as a voice, effectively neutralizing him. I'm not sure about the musical aspect of the film being an advantage, as Blues Brothers 2000 would show. To its credit, it doesn't appear to take itself too seriously and most closely resembles another family film, Harry and the Hendersons, the feel-good Sasquatch film of 1987. The Disney marketing machine is still a formidable force and not one to be trifled with, so for that reason, I will predict this film to make about $13 million this weekend. It would very tempting to think that after under-performing last weekend, both Stuart Little 2 and K-19 are primed for bigger-than-normal falls in the box office this weekend. While their positions are precarious, neither should face disaster this weekend. Both received good CinemaScore ratings and while Start Little 2 faces direct family competition from The Country Bears, the summer audience for family films is more than capable of handling both films at this level. Neither film will turn into a success, but they shouldn't just pack up their tents and go home, either. With about a 35% drop for each, their weekend figures would be about $10 and $8 million, respectively. Road to Perdition filled in the gap last weekend when none of the new releases stepped up to claim the number-one spot. However, its 30% drop is a misleading barometer of its performance; after adding 350 new venues, its per-venue average dropped a disappointing 42%, not the weekend a platforming Oscar hopeful would like. The film should still reach $100 million, but it's going to be much closer than DreamWorks would have hoped. It really needed to dazzle audiences and break out to the $150 million mark to ensure itself a spot in the nominations next spring. Men in Black II saved itself some embarrassment, avoiding a second straight weekend of 50% drops. Unless that transforms into 20% this weekend, though, it's a case of too little, too late. Although it's in no danger of ending in the red, especially considering the lucrative foreign markets, it'll end up as another could-have-been in this year's summer sweepstakes. Eight Legged Freaks failed to break out of its core horror audience, with its comedy elements either confusing potential viewers or just not coming across in the ads. Too bad, as it's one of the more entertaining movies this summer. Was Mr. Deeds really the better alternative? Look for it to fade quickly, dropping to about $3.5 million this weekend. $25 million will be a stretch for a final total, but it should have an excellent life as a video rental.